Diana’s dresses, blushing debutantes and mannequins posing in court dress set the stage for the distinctly feminine appeal of London’s Kensington Palace. From now through the end of January 2010, two very special exhibitions make this fairytale palace a must-see for female visitors to London in the year ahead. Kensington Palace most recently was home to England’s beautiful and much-loved Princess Diana. 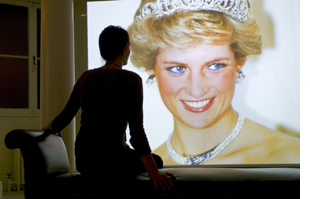 The first exhibit, a display of her gowns, illustrates how Diana’s taste evolved during her all-too-brief time at court. 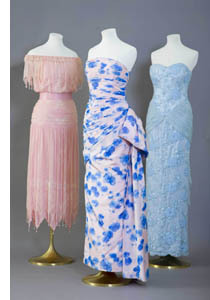 One of the most famous is a gown designed by Victor Edelstein. Many will recall the photos of a beaming Diana, glamorously clad in midnight blue velvet, dancing with John Travolta when she visited the White House in 1985. That particular dress was sold at a charity auction at Christie’s in New York in 1997 for the record-breaking price of $225,000. Other dresses on view include a “little black dress” designed by Versace and several creations by Diana’s favorite couturier, Catherine Walker. 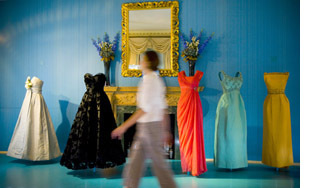 An adjacent room contains photos, sketches and books of fashions created by some of Britain’s leading designers such as Walker, Edelstein and Zandra Rhodes. The second two-part exhibition is called “The Last Debutantes” and “1958. Season of Change.” The companion displays celebrate the year England passed a bill allowing women into the House of Lords; the country installed its first parking meters; and British teens were dancing to “Rockin’ Robin” and “Chantilly Lace.” 1958 also was the last year debutantes were formally presented to the queen. That last season of young women “coming out” at court is illustrated by an appealing collection of memorabilia. On one wall, invitations to balls, cocktail parties, dinners and country weekends march floor to ceiling as proof of the hectic social schedule the girls enjoyed (or endured). A rainbow of evening gowns in lace, satin and tulle includes several designed for the wealthiest girls from famous couturiers like Christian Dior and Worth. Photographs portray debs and their beaus in evening dress, arm-in-arm with their parents, heading to formal afternoon teas and curtseying to the queen in all their finery. And speaking of curtseys, one film instructs debutantes on the proper way to curtsey. Another demonstrates to young men how to tie their bowties. While the temporary exhibitions are enchanting, a tour of Kensington Palace’s buildings and gardens is well worth the visit in any year. The ornate State Apartments have been open to the public since 1899, including the childhood bedroom and cozy sitting room of Queen Victoria. Kensington also hosts a permanent exhibition of court dress through the ages, featuring a display of the massive, silver-trimmed Court Mantua gown. The perfect end to a tour of the palace is sharing high tea in the Orangery. Built by Queen Anne in 1704 as a greenhouse sheltering the gardens’ citrus trees in winter, today the Orangery is open for breakfast, lunch and tea, offering treats like warm scones, Orangery cheesecake and autumn fruit crumble. Kensington Palace is open to the public daily, except December 24-26. The hours are from 10:00 a.m. to 6:00 p.m. March through October, and from 10:00 a.m. to 5:00 p.m. November through February. An adult ticket costs £12.30, but a savings of £1 per person can be made by booking in advance online. The Orangery and the palace gift shop are open during the same hours. For further information on Kensington Palace and the Orangery, visit: www.hrp.org.uk/KensingtonPalace.